This week my wife Alexis and I will be taking over the Modern Farmer Instagram from Skyelark Ranch in Brooks, California. 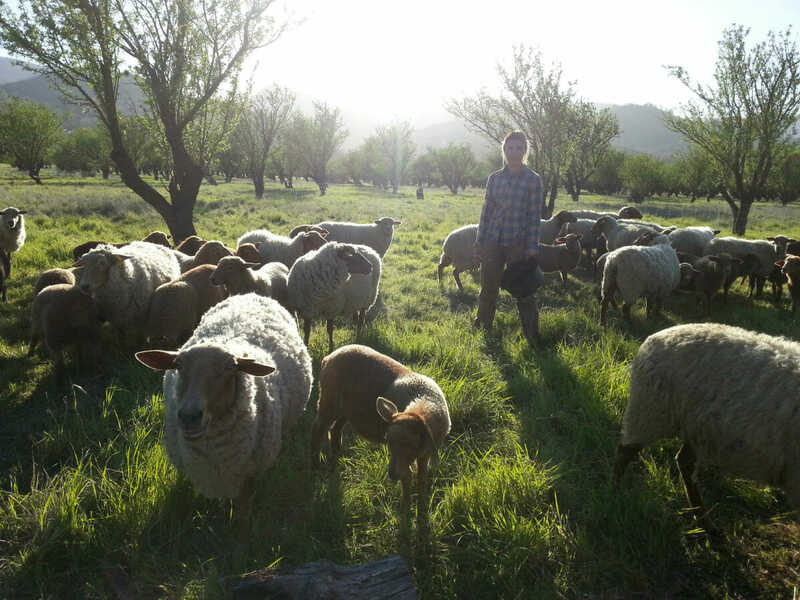 We lease 60 acres of land for our flock of 60 California red sheep, 15 or so Dorper sheep, and 2,000 hens. The sheep are raised for both wool and lamb and hens both for meat and eggs. When we leased the land in 2010, we unexpectedly became the owners of a hog. One pig was left on the land from the previous tenants. But there you go, we have continued to raise them. After meeting in Tasmania, Alexis and I settled in California in 2007. We had met in Tanzania of all places. I had moved their from Scotland, where I am from, and she was there an exchange program. In 2007 we settled in California with hopes of having a farm of some kind. Neither of us had what I call, being born with a silver pitchfork. We had very little experience farming. We had both studied environmental management, ecological agriculture, and Alexis had focused on argo ecology. We first tried our hand at farming and we quickly found out that I wasn’t very good at growing vegetables. I didn’t like the monotony of digging carrots for hours on end. We both did like working with animals, so we decided that was the better route. Alexis and I were complete greenhorns. We have been so lucky to be surrounded by such great masters of the land and sheep. We call them “our sheeple.” Everyday we are learning something new. I used to think it was just new farmers that were still learning, but it is everyone. Everyone is trying new things and hearing new things. It keeps you on your toes. Alexis makes fun of me for being on our Instagram all the time, but I truly like it. Originally we wanted a newsletter for the ranch, but it was clear that it would take up lots of time from the ranch. It only takes a couple of minutes and you can keep everyone up to date. Besides being good for our customers, a lot of our mentors and good friends are on Instagram which allows us to connect with them. Being from Scotland it is also lets me keep in touch with my family back home. You can follow us this week at Modfarm and always on our Skyelarkranch.